Is Your Dandruff Due to a Dry Scalp or Do You Have a Yeast Infection? This past week I have had a number of patients come in with the chief complaint of a flakey, itchy scalp. Most arrive thinking it is simple, persistent dandruff caused by a dry scalp but what most of them actually have is a case of yeast overgrowth on the scalp causing the itching. Yeast can show up anywhere on your body that is prone to moisture. Some of the most common places are the feet, nails, and the scalp. The type of yeast that grows on the scalp and causes infection is called Candida. The good news is that candida is a natural bacteria created by the body. It doesn’t cause any harm or damage to your skin when it’s balanced out within your system. Concerns arise when too much of this yeast grows and builds up on your scalp. What causes Candida overgrowth to occur? Most of the time, the amount of yeast your body naturally produces is perfectly healthy. But, when your body’s pH balance gets thrown off, too much of that yeast can grow and combine with bacteria. That’s when candida occurs. 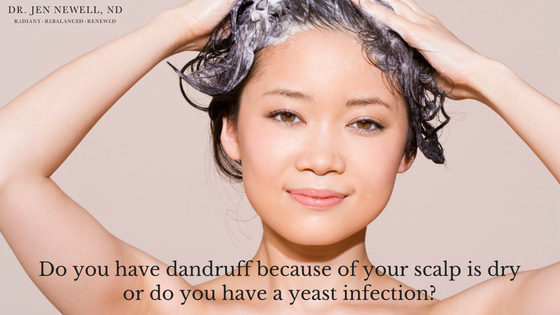 Most factors that cause an overgrowth of yeast on your scalp have to do with your lifestyle. One of the more common types of yeast that affects the scalp is Malassezia. It is naturally found in the sebum and oil secretions of the skin and tends to cause itchy greasy patches with thick yellow or white scales (seborrheic dermatitis). Because Malassezia is isolated to the oil glands it doesn’t tend to cause any other internal symptoms. How do we treat yeast overgrowth? If your body is naturally producing too much yeast and it’s affecting your scalp, it’s probably affecting other areas also. One of the best ways to clear this up is by making some lifestyle changes. As you start to manage yeast and combat it’s overgrowth you may experience unpleasant temporary side effects caused by yeast die-off – headaches, fatigue, flu-like symptoms, acne, and/or dizziness. Luckily, if you persevere these symptoms should resolve within a week or two of treatment. To determine whether your flaky itchy scalp is due to a yeast infection or just dryness contact me at the Integrative Health Institute to book a consultation and thorough assessment.